Who needs to take the General Chemistry Placements? Why am I required to take General Chemistry Placement 1? General chemistry (121, 122, 131, 132) are rigorous science courses, and build a foundation for many of advanced sciences you need to take in the coming years. Consequently, more than 26 degree programs at UNM required General Chemistry for their students, and many science subject courses use CHEM 121/131 as a pre-requisite course. The general chemistry is therefore, a gateway course for students pursuing science, engineering, or medical careers. It is recommended for you to take this course as early as possible. Even though you do not have the pre-requisite to take CHEM 121/131 at this point, this placement provides an opportunity for you to be qualified for these courses. It is designed to provide important evaluation not only of your math skills as required by the pre-requisites, but also on your problem-solving skills and other important preparation for this course. By completing this placement, you will learn whether you are ready for succeeding in CHEM 121/131, or identifying which course would be more appropriate for you. You would then be able to complete General Chemistry sequence earlier and finish your degree program faster. The goal of this placement is to increase your chance of succeeding in your undergraduate program at UNM, and to maximize your learning in Chemistry. Please take this placement and the recommendation from the placement seriously. Follow the instruction for the placement described below and do not skip any step. The placement has particular time requirements that you need to follow. It is also important for you to be total honest when taking the placement tests. Do not try to find external help in answering the test questions. If you are advised to take a different course as indicated by the placement result, please follow the recommendation. If you have any question, please do not hesitate to write an e-mail to Dr. Ho (khoj@unm.edu). When should I take the placement? You are advised to take the placement as early as possible. The placement exam is available online. Give yourself two hours for the placement exam. You should not be interrupted during the exam time. You also need a reliable internet connection for this exam. Please note that the time limit for ALEKS placement exams are 2 hours (120 minutes). If you spent more than 120 minutes, your test scores will be voided. Do I need to pay for the placement? What does it cost? 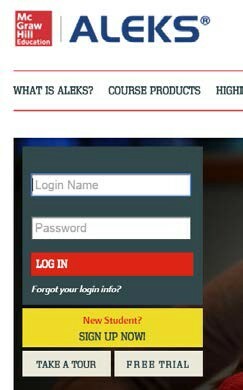 Access to this ALEKS placement is free. If you experience any problem about ALEKS, you can contact ALEKS support with the contact information printed in the end of this instruction. How do I take the placement? Please follow the link: 2018-2019 placement. IMPORTANT NOTE: You CANNOT use more than 120 minutes (2 hours) to complete the initial or final assessment. If you spend more than the above time limit, your score will not be counted and your placement will NOT be valid. What should I do after I am done with the placement? Generate a report (link) following the instructions in the link. Contact the Chemistry Chemistry Advisor (mareeka@unm.edu) or Engineering Advisors (vlepore1@unm.edu, skieltyk@unm.edu) with your report to request a pre-req override or seek advise about your placement. 2. Click on SIGN UP NOW! 4. Confirm you’re in the right course. A. You will be asked to solve about 20-30 problems (this will take you anywhere from 30 to 90 minutes – at any time you can logout and log back on, it will keep your place). It is recommended you have sufficient time to answer all questions all at once. B. You'll get no help at all, nor should you try to find any. If you were found using any form of external help when taking this placement, the placement result will be nullified and you will be reported to the Dean of Student Office for misconduct. C. IMPORTANT NOTE: You CANNOT use more than 120 minutes (2 hours) to complete the initial or final assessment. If you spend more than the above time limit, your score will not be counted, and your placement will be voided. A. You need to obtain 50% for CHEM 121 or 65% for CHEM 131. If your initial assessment has met the requirements for the course you want to register, you are done with the placement. B. If your initial assessment is 25% or lower, you can exit the placement and are strongly recommended to take CHEM 115 first. You can register into the summer section starting June. C. If your initial check is in between 25% and 50% for CHEM 121 or 25% and 65% for CHEM 131, you can continue to practice ALEKS topics (detailed tutorial) to increase the percent mastered for meeting the minimal requirement for your course (item 7 subsection A). You have up to three weeks to practice. D. During the practice period, you can work on the “learning mode” of ALEKS. 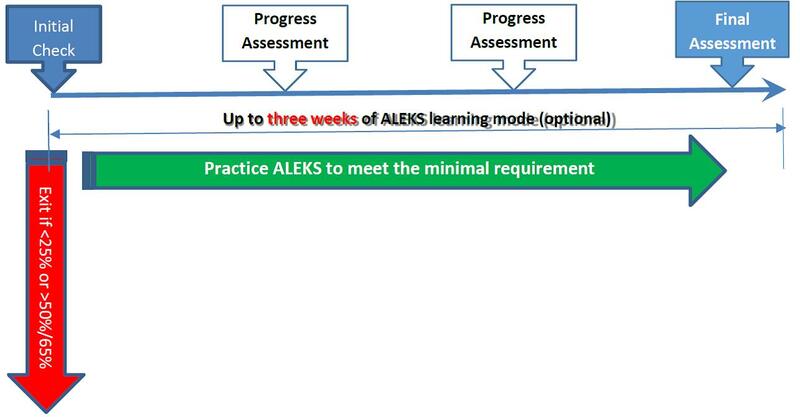 Progress assessments will be prompted by ALEKS after certain number of topics learned during the learning mode. You do not have to take the progress assessments. However, taking progress assessment can help you prepare for the final assessment. E. When you take the final assessment is determined by you (detailed tutorial). You can choose any time during the three-week period. You only have two chances for the final assessment. Do not take it unless you have learned enough number of topics and believe you can pass the minimal requirement for your course. You can find the final assessment under “assignment” section. A report of your final assessment must be generated after you complete it (detailed tutorial). Bring your final assessment report to your advisor to obtain the override for the registration of CHEM 121 and 123L. [Chemistry Advisor (mareeka@unm.edu) Engineering advisors (vlepore1@unm.edu, skieltyk@unm.edu). 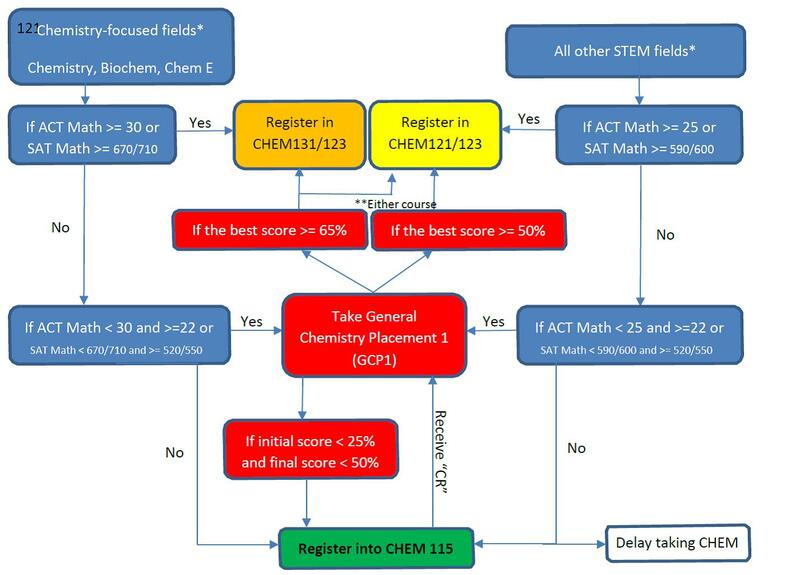 If you cannot meet the minimal requirements by the end of the three weeks from when you start the placement, you can register into CHEM 115 in the summer to prepare yourself for taking the ALEKS placement again before the fall semester so that you may be able to register for CHEM 121 and 123L. The requirement for Placement 2 is the same as that for placement 1. However, CHEM 115 is not appropriate for students who have passed the CHEM 121/123L. If you have a question about the placement, you can contact Dr. Ho (khoj@unm.edu). Having technical issues with accessing ALEKS? Contact tech support at ALEKS, they are very helpful, accessible and prompt! * It is not required, but strongly recommended for these majors to choose the indicated sequence to follow. For example, Chemical Engineering students can also choose the CHEM 121/122 sequence. ** Students with the best score of ALEKS >= 65 are recommended to take CHEM 131, but can choose to take CHEM 121.